It is often stated that no one rings a bell during market bottoms. For many years, I believed in this maxim, and stuck to the buy and hold approach. Now, 2.5 years since I started looking at the data, and documenting my thoughts during this ongoing experiment, I've changed my mind. Please don't get me wrong: I don't think that anyone can consistently pick exact intermediate bottoms and tops. What I do believe, is that one can do better than the venerable "buy-and-hold the index" strategy, by being more right than wrong on the direction of the markets. And this is what I set out to do some months ago as anyone following my writings since November 2007, has probably noticed. I looked at a few investors who are really good while being active. I watched what they do, and learned from their moves. I then applied my machine-learning skills to pick a large number of good features and build a intermediate-term timing model for the markets. So I now have a little bell that, I hope, would guide me in the future and will allow me to get defensive near/around intermediate market tops and get aggressive near bottoms. I don't expect my bell to be even close to perfect. In fact, as a machine learning practitioner, I know what is the expected error rate of the model. I also know that the real-time error rate may be bigger than the one I obtained during cross-validation. My hope is simple: that my little bell would be able to give me enough (rough) guidance to both outperform a passive strategy, and to assume less risk while doing so. Note that I said "hope". There's only one way to build confidence in my little bell model: to test it in real time. This real time period started two weeks ago and is already showing some initial promise. Two weeks are a too short period to draw any definitive conclusions. Only the future will tell exactly how accurate and reliable this model is. With the default of IndyMac last Friday, we now have another major financial institution failure. Similar to the Bear Stearns event which marked the intermediate bottom in March. Fannie Mae (FNM) and Freddie Mac (FRE) are under-capitalized based on fair accounting principles. Some hedge funds have been circling them with heavy shorting. Their stocks are in a free-fall similar to the ones we've seen in the recent past with both Bear Stearns, (BSC, which was taken over by JP Morgan Chase) and Lehman Brothers (LEH, which is still standing on its own). The interested can read some thoughtful comments on the recent Fannie and Freddie developments here and here. On the other hand: while the stocks tanked, Bill Gross bought a significant amount of Fannie Mae's debt (bonds), betting on a government intervention which will not allow Fannie to fail. This intervention can now be assumed as near certain based on Paulson and others comments during this weekend. Recent selling in the markets has been indiscriminate. All the strong assets which have been performing relatively well, like Coal, Clean Energy, Materials, Mid Cap Growth, Oil exploration, and BRIC, have broken down sharply in the past few weeks. This break down of the strongest "last men standing" is an almost exact repeat of what we've seen in the prior two capitulation phases (around January 22-23, and March 10-19, 2008). 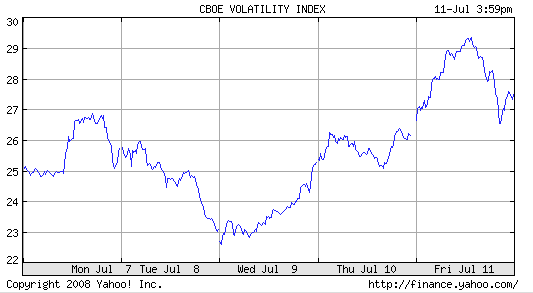 ^VIX - the implied volatility index, got to 29 and change during the Friday panic. A ^VIX of 30 or so was a key point which marked prior intermediate bottoms. 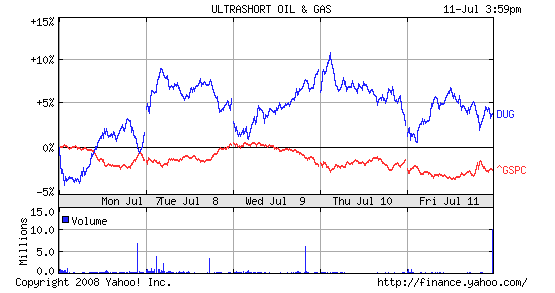 Surprise: despite crude-oil hitting new highs last week, the week has been very kind to shorts of oil and gas companies. Could this be the start of a new trend where the speculative bubble is finally starting to unwind? T. Boone Pickens is our hope. Please do your part, read "the plan", and join the movement. Can active beat passive? Is there an optimal level for being active? Ample empirical evidence suggests that being active (and good enough) pays. Let me share two data points with you. Marketocracy.com has several tens of thousands of registered users. I looked at many of the top performers who have enough history to convince me that their success isn't a result of chance. What striked me is how high their turnover is. Almost all of the top performers' turnover is in the many hundreds of percent/year range. Essentially, these investors know when to lighten-up a position and when to load-up. They are typically intermediate-term contrarians. They think in weeks, not in years. One of the best players, a German guy going by the screen name "greenab", has an annualized return of 41.5% in the past 3 years or so. His turnover is over 1022% in the past 12 months. This means he's been turning his whole portfolio at a rate of once every 5 weeks or so. Here are a few screenshots documenting greenab's performance. Henry was a bit early getting 100% long in this down leg, but as you can see, you don't need to be a perfect timer in order to outperform the markets and assume less risk. You do need to be good at integrating facts, be a data-driven contrarian, and have great conviction in your moves, though. And clearly, you also need to turn your portfolio over frequently enough to take advantage of the extreme ups and downs of the market. Take any upward sloping stock chart, imagine it is a string and stretch it in its general upward direction. Obviously it would reach much higher this way. This is self-evident, and is exactly what intermediate market timers are good at doing. Without going into the painful details, here's a brief description of my intermediate-term timing model. The model doesn't try to predict how individual ETFs or stocks are going to perform. 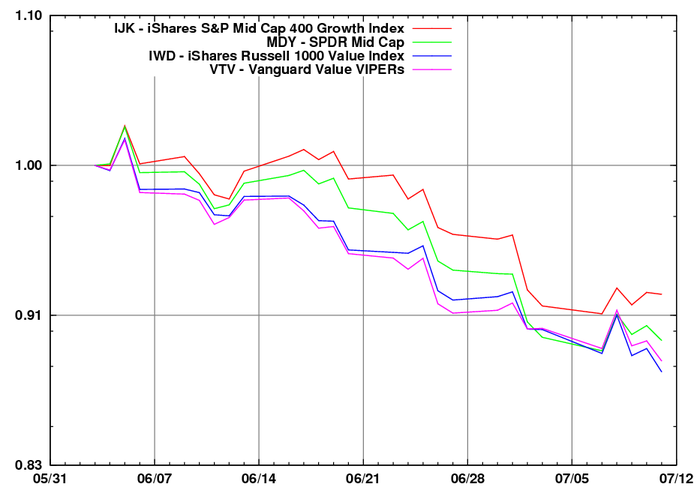 Instead, it tries to determine the average return of a large number of ETFs. The operating assumption is that if you know the average and the direction, you can then focus on the strongest/weakest members of the set and compensate for the inaccuracy of the average. The model universe is a "golden set" of BGI iShares ETFs spanning the whole world, a wide set of sectors, and broad asset classes. It deliberately avoids any non-equity asset classes such as commodities, currencies, or fixed-income vehicles. The model target is intermediate term return. 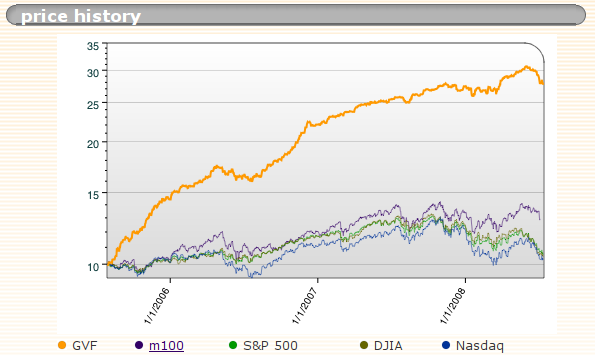 The current version only tries to predict the next month (22 trading days) average return of the golden ETF set. Note that 2 weeks before an actual bottom it could already signal that the next 4 weeks overall would be positive, assuming the last 2 weeks of the period can recoup the first 2 weeks losses. This means that the model is anticipating, as opposed to lagging as most MACD/momentum models are. The input features are very diverse and some of them look pretty strong statistically based on several feature-selection runs. The model doesn't look only at statistically overbought/oversold and overall market breadth conditions, but also at sentiment by way of volatilities, and at internal ratios between features that tend to mean-revert in the intermediate term. In other words, it tries to figure which ratios tend to oscillate in a somewhat regular fashion and figure out their typical values and durations. The model is a meta model: it uses an ensemble of separate sub-models. I also employed several techniques to avoid overfitting. The current version of the model has correctly called (out of sample) the recent 2 weeks sharp drop. While I only had the chance to run it this weekend, it turned slightly positive two weeks ago (for the next 4 weeks starting 2 weeks ago). Based on this reading the model thinks that as of this weekend (July 11, 2008) the markets should be around a tradeable bottom. The model estimated error rate based on careful cross-validation is about +/-1.7% per month for the average future return prediction. If on Monday (July 14th) the markets rally, and financials rally even more (a relief rally) it may erase and even reverse these gains. Still, I think this strategy is viable for the next few months as a low-risk bet for those who fear the market has still a way to go down. Then again, my own bottom bell has just given the signal, so I would at least partly cover the short part of the pair for now.